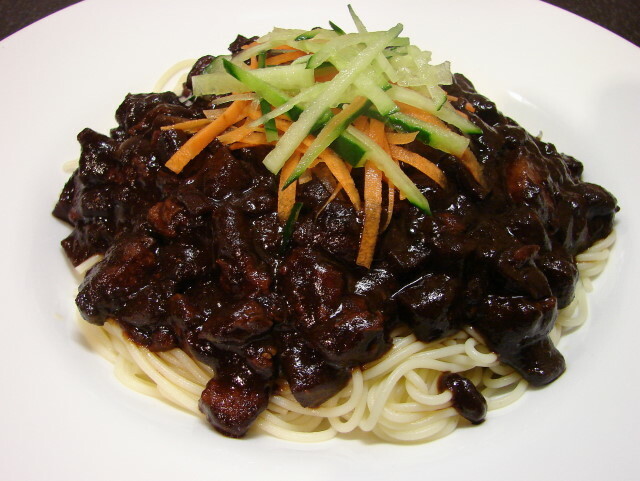 Jjajangmyun is Chinese Zha Jiang Mian Korean style. Jjajangmyun was introduced by Chinese immigrants living in Korea years ago. 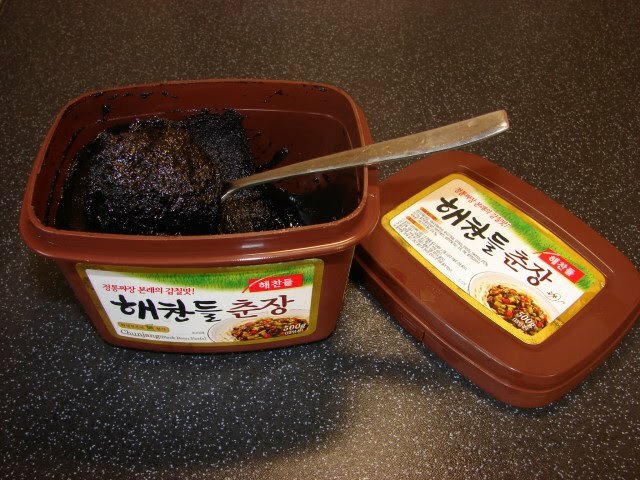 The main ingredient for the sauce is a Korean black bean sauce called chun jang. This black bean sauce is nothing like Chinese black bean sauce, so do not substitute Chinese fermented black bean (tousi) for this recipe. Chun jang is jet black and very thick, less salty than most Chinese bean sauces with a hint of sweetness, tastes a little bit like miso. Here is a picture of the one I used. I bought this when I was in LA not too long ago. You may find similar Chun jang in Korean supermarket in UK. There is no substitute, got to use Korean black bean sauce for this recipe. Other ingredients added to the sauce are meat and vegetables. For the meat can use pork belly (with or without skin) or fatty pork cut into very small pieces, minced (ground) pork or beef, chicken or seafood. Vegetables can be mixed and matched like potatoes, carrot, daikon (mooli), courgette (zucchini), button mushrooms and bell pepper. Onion is essential. Cooking method is slightly different to Chinese zha jiang mian. Chinese method is to stir fry the sauce till very fragrant and reduced before adding the bits and pieces. 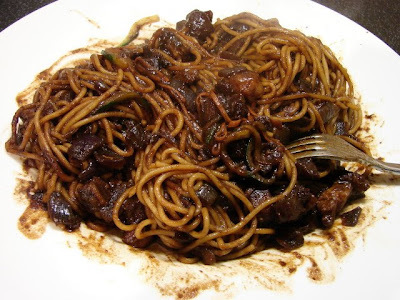 Korean Jjajiangmyun is different where the meat is browned first, then add vegetables with the black bean sauce. Personally I find Chinese zha jiang mian sauce is more fragrant than Jjajiangmyun sauce. Korean is quicker and easier especially using minced meat. Both Chinese and Korean are tasty. I like both. For the noodles, authentic recipe use Korean handmade fresh noodles. There are no such noodles available anywhere near me and I was too lazy to make some handmade wheat noodles. So I opted for spaghetti which works quite well. Here is a picture of the sauce ingredients. 1 cup each of diced potato, carrot, daikon (mooli) and onion. I used red onion, white or yellow onion is fine. Amount of pork is about 1 lb (450 - 500g). For the Chun jang (black bean sauce) I used about 125g (can up to about 150g). Finally a little sugar, pinch of ground pepper and pinch of salt (salt is optional). You may need cornstarch if you like the sauce much thicker. Cooking method is easy. Heat wok and add a little cooking oil then fry pork pieces till light golden brown. 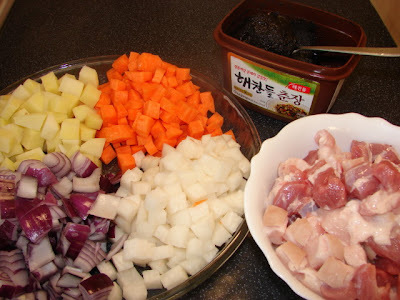 Remove pork and add onion stir till onion is softened then add the black bean sauce, stir for a while then add carrot, daikon and the fried pork. Add enough water to cover vegetables and meat, let this boil for few minutes then lower heat and lid on and simmer for about 20 minutes then add potatoes. Continue cooking for another 15 - 20 minutes till meat and vegetables are tender and sauce has thickened . The potatoes will help to thicken the sauce, if not thick enough can thicken with a little slackened cornflour (cornstarch). Add pinch of pepper to taste. Have a taste then add sugar and salt to your taste. This sauce recipe is enough to feed 4 - 5 people. If using minced (ground) meat, chicken or seafood, add potato the same time as carrot and daikon. Total cooking time is lessen to around 20 -25 minutes, and even less for seafood. For the noodles I used fine spaghetti called Fedelini. You can use other plain dried Chinese wheat noodles. Udon works well too. If you are lucky to have a Korean grocery store near you, then best get those fresh handmade myun (noodles) specially for jjajangmyun. Another good option is handmade noodles or pasta. Cook noodles/ pasta per instructions and enough for everyone. To serve, pile noodles on a plate then spoon on the dark meat/veggie sauce. Garnish with some shredded cucumber and/or carrot. If you have some yellow pickled daikon and kimchi, serve as side dishes, they go very well with the noodles. Mix and enjoy. Simple comfort food I will never get tired of. I love Korean food. This one is also my favourite...looks very delicious. Thanks Mary. I adore Korean food too especially their tabletop bbq.